Each of these types of accessories is introduced below. Please contact us with any further questions on how best to include these items in a system configuration. Other installation accessories, including secondary display consoles, are described on the Davis System Accessories page. It’s worth noting that VP2 ISS (the main sensor transmitter – always includes the anemometer) and console units are all available as separate items. These units are described in detail on other VP2 pages – please see the subitems on the main VP2 menu for further information. Both 6334 and 6825 units are also available as cabled units if required (6334C and 6825C respectively). 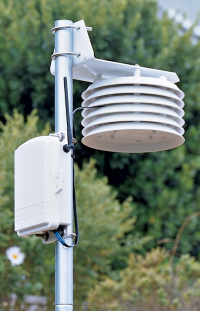 All Vantage Pro 2 stations – cabled and wireless – will accept either or both of these two sensors, which are mounted on a small shelf assembly that sits alongside the rain gauge and that needs to be bought as a separate accessory item. Both sensors, together with the mounting shelf, are also available pre-assembled in the VP2 Plus models. The UV sensor in particular is a relatively expensive item to make and this accounts for the significantly higher cost of the Plus models. 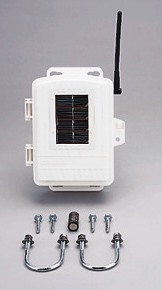 Users interested only in the solar radiation sensor – pictured left, though the UV sensor looks similar – can buy this as an accessory (plus mounting shelf) for the standard VP stations at lower cost than buying a VP Plus model. (But for users looking to add both solar and UV sensors soon after buying their initial station, remember that the Plus package price offers a substantial cost saving compared to adding both solar and UV sensors separately). 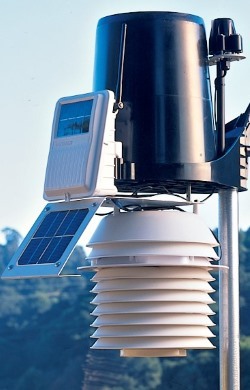 The solar sensor’s function is to monitor the strength or power of sunshine (mostly in the visible part of the spectrum), obviously an important weather parameter in its own right, but especially relevant also to stations for agricultural applications, for example to allow the calculation of evapotranspiration (ET), which the VP console can display directly. The UV sensor’s main application is in monitoring of UV intensity, which is of particular health-related interest, for example to assess sunburn risk. Note that the solar sensor measures global solar irradiance levels. This is the sun’s strength in units of watts/square metre and the best objective measure of the sunshine’s power. The VP console has no direct ‘hours of sunshine’ readout, although this can be calculated, to a rough approximation, by the Weatherlink software from logged solar radiation data. More sophisticated algorithms for conversion of logged solar data to sunshine hours are also available in add-on software. Users interested in measuring true sunshine hours readings should take a look at our Instromet sunshine sensors page. These sensors will typically need to be bought as a separate standalone sensor with its own counter readout, although there is an option to interface one of these sensors to a Davis station, but only within certain limited system configurations. In practice, we don’t encourage use of the 24-hour FARS in the UK, although we’re happy to supply them for customers who still wish to order. In UK winters there can be a succession of short, gloomy days, providing insufficient sunlight to keep the FARS fan spinning. Under these conditions the temperature response may actually end up being worse than with a passive shield. So the Daytime-only FARS may be a better UK choice. The standard versions of all VP2 stations are fitted with a passive radiation shield to prevent sunlight falling directly on the temperature sensor and hence giving erroneously high readings. This passive shield works well for the great majority of days in the year but, inevitably, on the hottest/brightest/calmest days the air temperature inside the shield may be up to 1-2°C above the outside air temperature. For users seeking ultimate temperature accuracy, all VP2 stations can be specified with a fan-assisted radiation shield (FARS) rather than the standard passive type. 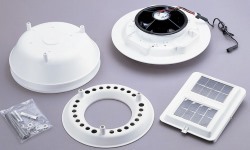 A fan actively draws a steady flow of air over the temperature sensor and hence reduces any disparity between temperatures inside the shield and outside. In addition to providing more accurate readings of air temperature on calm/sunny days, the FARS shields also improve the responsiveness of temperature readings under weather conditions where air temperature may be changing rapidly. The 7747 Daytime-only FARS (DFARS) shield: This is a simplified and therefore cheaper FARS version that is an add-on to the standard passive VP2 shield and runs off solar power only. As an add-on, it still preserves ventilation by normal breezes (in contrast to the 24-hour FARS, which uses a different and more enclosed shield case). DFARS obviously runs only during the daytime, but this is of course the only time when shield heating effects are likely to be of major concern. This 7747 unit is a user-fitted kit that may be specified with a new station or bought at any time subsequently. Remember that the DFARS kit must be installed by the user but this is a very straightforward job taking maybe 15 minutes – full instructions provided. The 24-hour and daytime-only FARS units do look superficially similar to one another, but the 24-hour unit has a taller shield with two extra elements plus a more prominent air intake at the bottom, betraying its more enclosed shield design. The other visual clue is that the 24-hour FARS needs its own separate solar panel, whereas in the DFARS unit a supplementary panel is included in a replacement cover for the main SIM board compartment. These differences should be evident in comparing the two pictures above of the 6334 Agricultural ISS and the ISS fitted with the 24-hour FARS. A FARS shield inevitably adds somewhat to the cost of a VP2 station and many customers conclude that it is an unnecessary luxury for the few days a year in the UK when it might make a material difference to temperature readings. But for those users who are tempted by a FARS shield, the 7747 DFARS kit does offer a good compromise between cost and effectiveness. 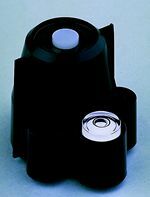 In 2016 and as a further extension to the flexibility of the VP2 sensor range in allowing custom sensor configurations, Davis released the 6830 and 6832 shields. 6830 has the standard passive radiation shield while 6832 has the 24-hour FARS shield (see above). The shield bracket mounts in the usual way either to a pole via U-bolts or to a flat surface such as a wooden fence post. Both 6830 and 6832 also contain a standard temperature/humidity sensor fitted with a 7.6m cable. In other words, 6380 is effectively the radiation shield from the 6382 Supplementary Temp/Hum station described in the section below, but available as a separate part and fitted with a longer cable to provide greater flexibility in positioning the shield. The cable simply plugs into the temp/hum socket on any suitable transmitter board whether ISS or supplementary transmitter. The main use of 6380/6382 is likely to be for configurations where it’s preferable to separate the shield and transmitter positions, but it is also a relatively cost-effective pre-fitted replacement for an existing temp/hum sensor that may be reaching the end of its service life (assuming that the user is happy to mount the new shield separately). 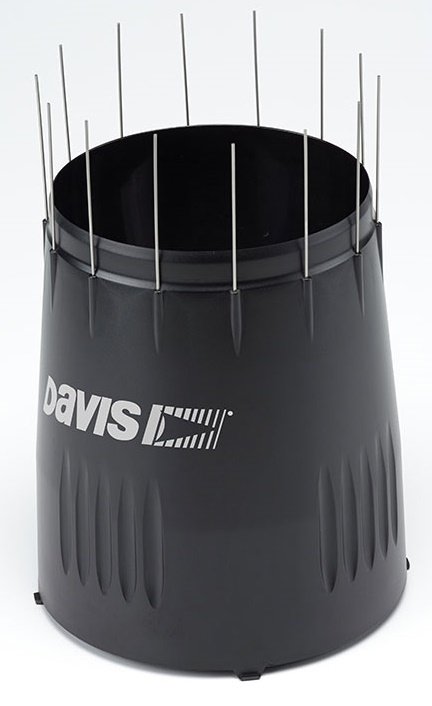 The extra sensors necessary to measure additional temperatures, humidity, soil moisture and leaf wetness are termed ‘supplementary stations’ by Davis – a term we find a little confusing though we use it here for consistency with the Davis catalogue. 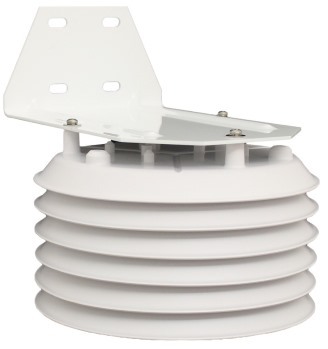 These so called stations are a set of wireless-only units consisting of a wireless transmitter in a weatherproof shelter plus various attached sensor elements. But these are not standalone units – a console is also still required to receive and display the data. Typically, each supplementary station is mounted completely independently of the main ISS and relays data directly back to the standard VP2 wireless console via its own separate wireless data channel (and not via the ISS). Cabled VP2 stations cannot be configured with supplementary stations. Supplementary temperature sensors read to a resolution of ±1°F on the standard VP2 and Envoy consoles, rather than the 0.1°C of the ISS temperature sensor. (This is a result of how the supplementary data streams are handled inside the console rather than of poorer intrinsic temperature accuracy). The Envoy8X console will preserve readings to the full 0.1°F resolution. For information, the 6332 Anemometer Transmitter and 6372 & 6382 Supplementary Temp/Hum Stations (but not the 6345 transmitter, which has very different circuitry) are all fitted with the same transmitter board as the standard ISS unit. These transmitters are therefore provided with input sockets for wind, temp/hum, rain, solar and UV, exactly as for the ISS. Do not assume however that sensors may be freely plugged into these supplementary transmitters – the standard console design strictly limits which combination of sensors is permitted. Only the Envoy8X console can receive readings from any combination of wireless transmitters. A maximum total of eight stations can report back to a single VP2 console. (Remember though that eight would use all available wireless channels and therefore no other station, not even an ISS, could be used in this configuration.) Each 6372 or 6382 station accepts only a single temperature sensor and therefore one station is required for each additional temperature reading that is to be measured. Note that while up to eight 6372/6382 readings can be displayed on the VP2 console, only three additional temperature values or two combined temperature/humidity readings can be logged and processed by Weatherlink (in addition to the main ISS temp/hum values). Remember also that supplementary temp/hum values are held to a resolution of 1°F (or equivalent in °C). Until Spring 2016, both 6372 and 6382 units ran on a single CR123 lithium battery only, that is without solar panel assistance (a solar panel door is available as an optional extra) with each battery expected to last a minimum of 6-9 months. But from mid-2016 on, the 6382 unit (but not 6372) will have the solar panel door fitted as standard. 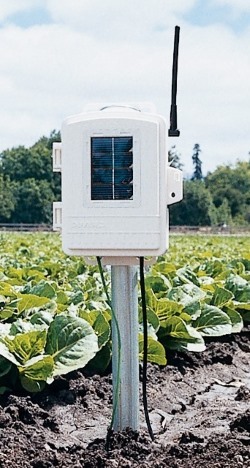 This is effectively a multi-sensor station comprising a 6345 wireless transmitter unit (shown left – mounting pole not included) to which can be attached a variety of sensor probes for measurements of soil moisture (potentially at different soil depths), and/or of leaf wetness, plus temperature. Clearly, the 6345 station is of most interest to potential agricultural and horticultural users. Data from all sensors connected to a 6345 transmitter passes back to the display console over a single wireless channel, so making optimal use of the available data bandwidth. The 6345 stations are powered in exactly the same way as the mains ISS, ie a small solar panel is used to supplement the standard lithium battery. There are three types of sensor which can be fitted to these stations ; soil moisture, leaf wetness (shown above right) and temperature. These can be used in various combinations. The temperature sensor is of a similar air/soil/water type as the 6372 station above and can therefore be used to measure the temperature of any medium. The 6345 transmitter can be fitted with up to four temperature sensors and can therefore become a specialist temperature-only sensing station if required. Although only one 6345 can be linked to a single VP2 console, it can pass readings from all four sensors to the console across a single wireless channel. 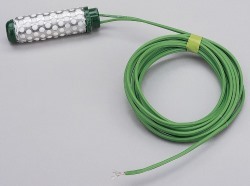 The 6345 unit can also accept up to four soil moisture sensors, each probe being supplied with 15′ (4.6m) attached cable. For soil moisture measurements, the moisture reading varies with temperature at the probe depth. 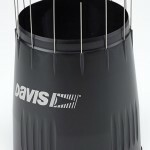 The Davis stations are therefore designed to temperature-correct each moisture reading individually, which is achieved most accurately if a moisture probe is paired with its own temperature sensor buried close by and at the same soil depth. So up to four pairs of moisture and temperature probes can be added, for example to assess moisture at different depths at the same location. Please remember that supplementary temperature values such as those measured by 6345 sensors are limited to a resolution of 1°F (0.5°C). The 6332 wireless anemometer transmitter is specially designed to accept the input cable from a standard VP2 anemometer and to broadcast the wind speed and direction data on a separate wireless channel. With this transmitter, the anemometer can be completely separated from the main ISS sensor assembly and anemometer and ISS mounted in quite different locations, so allowing much more flexibility and convenience in siting the anemometer. 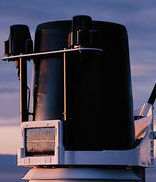 (Normally, the anemometer can be mounted separately from the main assembly, but the two must be connected by cable in order for the anemometer readings to be transmitted back to the console by the single ISS transmitter). NB This item can also be used in conjunction with a Vantage Vue station. NB 7857M is the metric (0.2mm tip) version of the 7857 gauge. The plain 7857 part number is the imperial (0.01″) version. 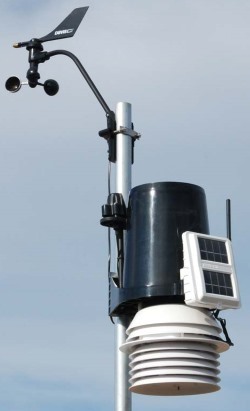 The combination of all of these new features provides a gauge that can be easily mounted to a convenient pole or post; one that should be much less prone to blocking by extraneous debris; and one that can deliver accurate and cost-effective rainfall measurement (with fine calibration, if required). This standalone version of the gauge is supplied with a 12m cable attached and is fully plug-compatible with the standard VP2 rain gauge input on the ISS. NB This gauge is not suitable for use with the Davis Vue station. The cone (and anti-perching pins plus new debris screen) from the latest 7857 rain collector is available as a separate kit – see image right (click to enlarge). 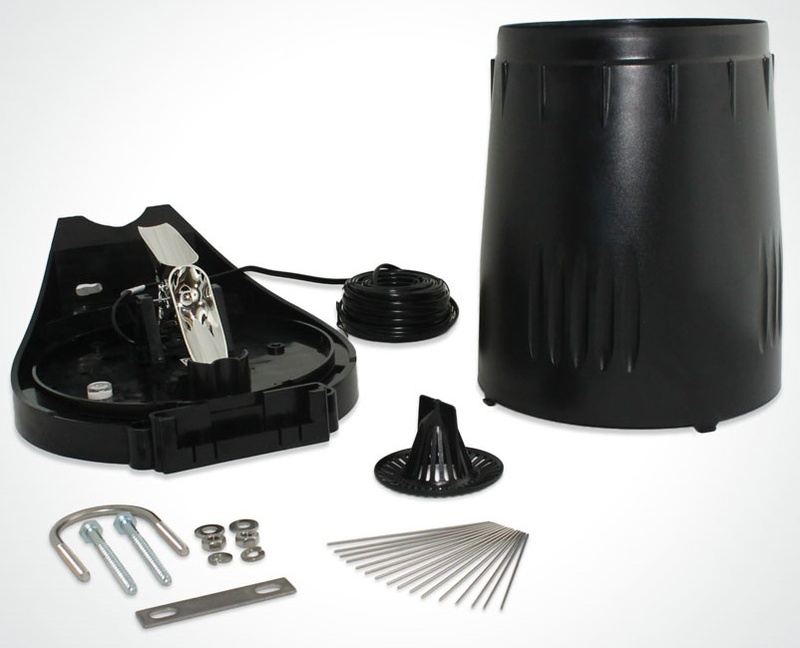 This kit can be used to upgrade any existing Vantage Pro or Vantage Pro 2 rain collector (or indeed 7852 standalone WMII-type rain collector) in order to add in the latest ant-blocking features. The kit is available from our online shop. The existing/traditional Davis 7852 standalone rain collector with its flat base and lack of anti-blockage protection will continue to be available for as long as stocks last.